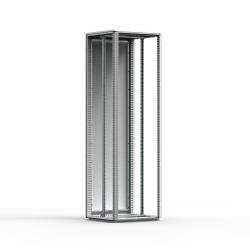 The mild steel combinable floor standing ICT enclosure range, MCI, is made up of integrated 19" profiles and a rear door. It is an ideal solution for ICT applications, and requires only limited assembly time, since the profiles are pre-mounted. Procurement is made easy with only one single item number for the whole solution. Frame: 1.5 mm steel plate. Door: 2 mm steel plate. Roof plate: 1.5 mm steel plate. Bottom plates: 1 mm galvanized steel. 19" profiles: 2 mm zinc plated steel. Mounted with hinges, allowing left or right hand opening. Including door frame with 25 mm hole pattern. Provides front and side universal 19" hole pattern. Adjustable in depth by steps of 25 mm. Frame, rear door and roof plate: RAL 7035 structured powder coating. 19" profiles: zinc plated steel. Complies with IP 56 | TYPE 4, 12, 13 | IK 10, when plain front door and side panels are fitted. Add side panels for closed sides. Front frame can be covered with FFC or fitted with a glazed or plain door. Frame with fitted rear door, roof panel, bottom plates. 19" profiles at front and fixing brackets CIB. For enclosures 2200 mm height, delivery includes two CMB profiles mounted in depth. Delivery also includes earthing bolts. Delivered on a pallet which is identical to the width of the enclosure to allow baying without removal. All packing material is recyclable. Mild steel combinable floor standing ICT enclosure with integrated 19" profiles and a rear door. A standard pre-configured enclosure solution for ICT applications. 19" profiles are already mounted reducing customers assembly time. The enclosure solution reduces customers labour cost, while increasing their procurement efficiency as the enclosure solution has a single item number. A front frame, FFC, or front door (plain or transparent) along with mounting kit, DNMK, is required to complete the enclosure solution.